Floating - Single Sink Vanities Are you looking for a standard type of cabinet or changing it up a little with a wall-mounted cabinet? Both are great choices for single sink vanities and each of their own advantages. Freestanding vanities are known for their easy installation process and are great for budget remodels. Floating vanities are a little fancier since they require extra processes for installing it. 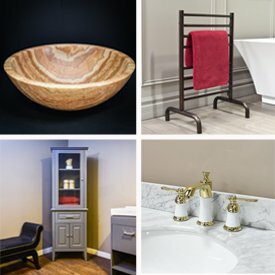 Wall-mounts and keeping the vanity level are a few tricky factors to installing. However, floating vanities create a beautiful aesthetic to your bathroom and is sure to raise eyebrows. For Floating vanities, Luxury Living Direct has a large range of styles, finishes and configurations to meet your needs. If you are looking for 2 or more Floating vanities, give us a call at (800) 574-3022 and we’ll quote you out a special price!